Whimsical design brings unique personality to this metal horse sculpture. Handsomely constructed from heavy gauge steel plate, finished with a naturally acquired rust patina, and then carefully hand brushed with metal sealing oil. 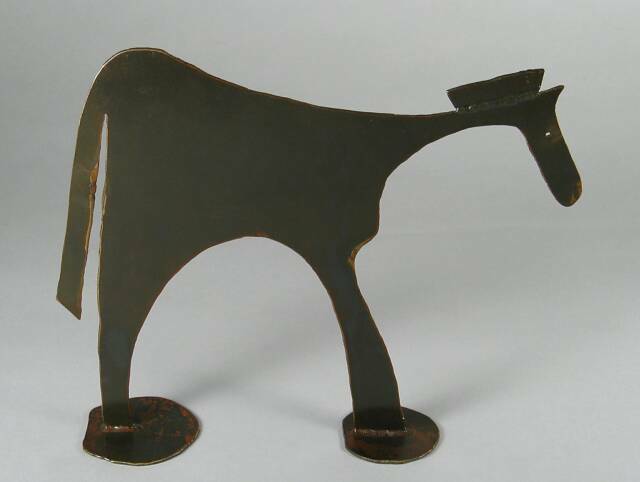 A fitting home accent for the home entrance, foyer, fire place mantle, or used as a door stop, your whimsical farm horse will delight everyone. I start out by hand-cutting individual pieces from heavy steel plate using my plasma cutter. Then I grind the rough edges and assemble the pieces together using my tig welder. The fabricated piece is then cleaned with salt & vinegar to start the metal oxidation process, and then placed outside to develop its unique, naturally acquired rust patina. After several days of oxidation, I wash and clean the piece with water, let it dry, and then hand-brush with Penetrol - a metal sealing oil that dries hard to a rich glossy finish.